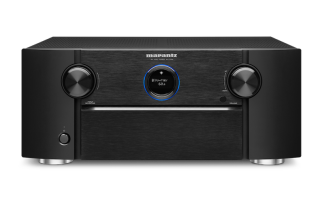 Marantz expands home cinema offering with AV7704 preamp | What Hi-Fi? The 11.2-channel AV preamplifier replaces the current AV7703 and sits below the company’s flagship AV8802. Marantz claims the AV7704 improves on its predecessor thanks to upgraded components for better sound, and by adding Auro-3D audio decoding to the existing support of Dolby Atmos and DTS:X. Unlike Marantz’s recently-announced SR7012, which has 200 watts of amplification on board, the AV7704 receiver requires external amplification. Marantz will no doubt point you to its MM8077, MM7055 and MM7025 range of power amplifiers. But like its amplified amigo, there is full 4K support – all eight of its HDMI inputs have 4K passthrough, with support for Dolby Vision HDR and Hybrid Log Gamma (HLG) coming via future updates. And there's HEOS' multiroom network system for streaming music from, for example, Spotify, Tidal, Deezer and TuneIn. Also “coming soon” is eARC (Enhanced Audio Return Channel), which supports the transmission of immersive audio formats, from TV apps like Netflix, via HDMI connection. There are three HDMI outputs: two main zone outputs for running two displays simultaneously, and one for a second zone. The AV7704 offers DSD (2.8/5.6MHz) and FLAC, ALAC and WAV (up to 24bit/192kHz) playback. And as far as offline streaming goes, there’s Bluetooth and Airplay. The AV7704 also features a correctional Bass Sync feature, which before now was only incorporated on flagship Marantz and Denon AV amps. The AV7704 will be available from October, priced at £1900.